The Office of Financial Aid and Scholarships coordinates the SDSU scholarship application and awarding process with committees from the various departments and organizations responsible for selecting recipients. SDSU awards scholarships to students to recognize and encourage individual talents, academic achievement, leadership skills, and the determination to succeed in spite of significant hardships. SDSU scholarships also are awarded to students to support participation in SDSU approved study abroad programs, community service programs, and faculty approved conference attendance that is part of a student’s SDSU curriculum. Who can apply for SDSU scholarships: All students, regardless of grade point average, area of study, citizenship, or residency status are encouraged to apply for all scholarships for which they may be eligible. How to search for SDSU scholarships: Your main resource for finding SDSU scholarships is the SDSU Scholarship Search tool. In addition, check with your academic department for other scholarships that may be offered exclusively through the department. How to apply for SDSU scholarships: Review the steps of the online application process, including submitting your application materials and tracking your application status. When to apply for SDSU scholarships: Learn about the application cycles and deadlines, late and incomplete submissions, and when you can begin applying for SDSU scholarships. How recipients are selected: Learn about steps in the selection process, the scholarship committee, and the policy against discrimination or preference in the recipient selection process. Essay writing tips: All SDSU scholarships available through SDSU Scholarship Search require that you submit an essay online. Get tips for writing an essay and see several examples. Thank you letters: To receive your scholarship, you must first submit a thank you letter. Get tips for writing a letter and see several examples. Scholarship enrollment exception request: A form for students who have been selected to receive an SDSU scholarship but who will not be enrolled full time and/or will not be enrolled for the full academic year. SDSU scholarships and study abroad: Learn about scholarships and study abroad, how to check your scholarship status, application deadlines, and more. Note: Each scholarship opportunity is dependent upon the availability of sufficient funding. If funding is not available, the scholarship will not be awarded. 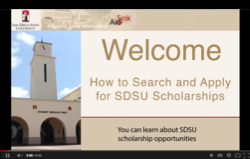 Watch a video about how to search and apply for SDSU scholarships. Video made possible by the generous support of the Aztec Parents Association. SDSU scholarships are made possible by contributions from generous donors who want to invest in the future while demonstrating their support of a university education. Funds are provided by private donors, corporations, professional associations, and SDSU alumni.